There’s more credit score information available than ever, but unfortunately, many consumers continue to hold harmful misconceptions about credit scores. Here are 20 credit score myths and the truth about each. A bad credit score will only last forever if you continue to make choices that hurt your credit score, i.e., paying late, maxing out your credit cards, letting bills go to collections, etc. Otherwise, if you start managing your credit well, your credit score will improve with time. It only takes a few months to ruin a good credit score. At six months past due, your account will be charged-off, which is one of the worst things you can do to your credit score. Multiple charge-offs or collections can completely ruin your credit score. You can check your credit as many times as you want without hurting your credit score as long as you’re using credit scoring services, and not mortgage lenders, to check your score. How much money you have only indirectly affects your credit score. Income isn’t a factor in your credit score. However, bill payment habits (which are impacted partially by your income) do factor into your credit score. No matter how much money you have, paying your bills on time is the best thing you can do for your credit score. Each person has several credit scores because there are several different credit scoring models. And for each credit scoring model, there are three different credit scores for each of the major credit bureaus. The credit score you get online, whether free or purchased, is an educational credit score and typically not the same credit score your lender is going to use. While the educational credit score can give you a general idea of your credit health, you can’t take for granted that you’ll be approved based on that score. You and your spouse will continue to maintain separate credit histories and credit scores after you tie the knot. Joint accounts will affect both of your credit scores, but individually-held accounts will affect only that account holder’s credit score. Bad news for anyone who applied for a prepaid or debit card hoping to improve their credit score: there is no “credit” aspect to debit or prepaid cards and your history with these cards isn’t factored into your credit score. Credit cards and loans are the primary financial products that impact credit scores. It is against the law for employers to use credit scores to screen job applicants. The media routinely gets this fact wrong because people do not understand that credit scores and credit reports are not the same things. An employer can check your credit report but not your credit score. Closing a credit card is more likely to hurt your credit score than to help it, particularly if you close the card with a balance. Leaving accounts open, especially if they’re in good standing, is typically better for your credit score. Bank balances aren’t a factor used to calculate your credit score. There may be a correlation between good savings habits and good credit scores, but a person can have a bad credit score and a lot of money in the bank if they’re not using the money to pay their bills on time each month. Paying a collection account can help your credit score in the long run, but don’t expect an immediate increase from paying a collection. Once the collection is on your credit report, it factors into your credit score until the credit reporting time limit runs out. There’s an exception for collections under $100, but only with newer credit scoring models that ignore these low collection amounts. 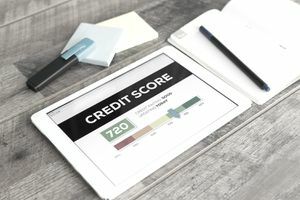 A bad credit score makes it harder to get approved, but it’s not the only factor that creditors and lenders consider when they’re evaluating your creditworthiness. Income and level of debt are other factors that play a role. You can be approved even with a bad credit score, but required to pay a security deposit or a higher interest rate. Most negative information stays on your credit report for seven years, but as negative information ages, it impacts your credit scoreless. You can improve your credit score before the negative accounts fall off if you make timely payments and keep a reasonable level of debt going forward. You can dispute credit report information that you believe to be inaccurate, but that doesn’t guarantee the information will be deleted. And, if your dispute is returned in your favor, there’s no guarantee your credit score will go up. The inquiries made when you apply for new credit are 10% of your credit score. Inquiries can hurt your credit score, but the exact effect on your credit score depends on all the other information on your credit score. It’s possible that your credit score may not move at all after you’ve made an application for credit. You need to use credit products to build a good credit score. That can be as simple as opening a credit card, charging a small amount with it each month, then paying it off every month. You don't have to - and shouldn't - create more debt than you can afford to build a good credit score. Your level of debt is a factor in your credit score, but it comes second to payment history. If you paid off your debt after a bout of bad credit, it might take several months, years even, for your credit score to rebound. And if you’re debt-free because of bankruptcy, then you have the burden of bankruptcy weighing on your credit score. Every consumer should check their credit scores and credit reports periodically throughout the year – one time at a minimum – to verify their credit health. Monitoring your credit score regularly at least lets you confirm that you’re managing your credit well.